then it makes sense…too many toys now! after every use and engine bay is kept well lubricated for protection also. This is the VXR Waverunner, 1800CC non supercharged (180hp). worry about it blowing! I’ve not see a higher HP N/A ski. The ski also comes with a trailer, which was new in 2015.
galvanized and includes trailer board, fully functional winch and straps. not to look at it. * Waverunner is advertised elsewhere, seller reserves the right to end the AD early. 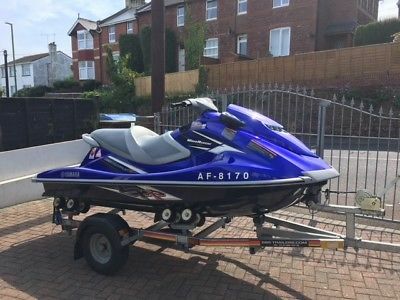 This Yamaha Waverunner Vxr Jet Ski Pwc boat is located in Paignton, TQ3 3NS and is being sold on eBay by harbie2000.